Clever, clever, clever. 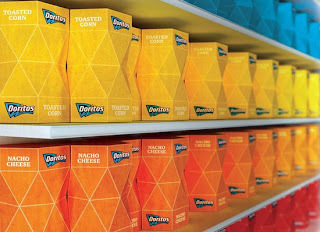 I love seeing clever design, especially when it comes to package design. I love package design and when I see something really different than what has been put out on the market I get really excited and this redesign is no exception. If anything, it excites me more than most others because the designer, Peter Pavlov, is reaching out to other designers to help him with this redesign. 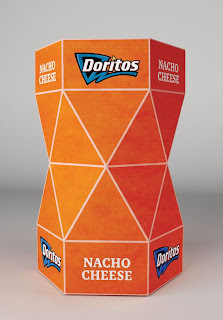 "The shape and the texture of the Doritos chips are used as the base of this packaging concept. What's good about the form of the packaging is its structure which can keep the chips closed after opening. Currently I'm developing illustrations which can replace the textured solid colors. I also invite every designer interested in collaboration to create artworks of his own." The collaboration comes into play with that last bit. If you go to his Behance Gallery, you can download a template to design your own graphics to go into the triangles. Anybody can submit ideas and the wider variety of designs the better it can only get. This concept is actually really quite a wonderful one. Ideas like this have been done before with Pepsi and other soda products that let consumers submit their own can designs and then the best were picked out and they mass-produced them. I will most definitely look into designing some triangles for this project and I think that everyone who sees this should also consider designing for the project as well. Why not? It's an easy way to get your name out there and who knows what could end up happening with this project? Your designs being mass-produced for the entire consumer population to see? Not badddd.